Over half term my Sony Cybershot camera wasn't charged at all and as I blissfully focussed on recharging myself and having fun with the kids I opted for using the smart phone for all photos. I didn't even go near my laptop bag let alone my laptop to get the charger. In fact this is my first time on my laptop in I don't know how long. Very handy having all of my half term pics on the phone actually as it meant they were in the right place for ease of Instagram posting. I really needed speed with the pic below. This is what happened... Friday we headed off to our favourite sunny play spot Hengrove Park but because Aaron was using my phone charger before we left my smart phone was only on 30%. I took lots of photos and videos on arrival at the park, of course sharing to Instagram stories too, meaning for the last couple of hours at the park my phone was dead. Which in a way was nice as I then connected fully with the kids instead of looking at them through a lens. Hengrove Park kicks out strictly at 6pm though so off we went soon enough and I connected my Samsung Smart Phone to Daddy's car battery - glad I did as I had a lot of messages from my friend Not A Perfect Parent. Lottie and Lola are only 10 days apart awwww. When we stopped near home to get slush puppies I put my smart phone onto power saving mode and I think thanks to the car charger it was at about 9% at this point. We went to a park near home so that Daddy and Aaron could play football as none of us were quite ready to go home yet on such a glorious evening considering it had rained since the close of a beautiful day in the garden Monday. Back to Friday: Lottie and I played on the swings and slides. Just as she got bored and we joined Daddy and Aaron, Daddy threw her in the air. I was transfixed, captivated in the moment and didn't even think to video or take a pic. Except suddenly I came out of my daydream and was like "Daddy can you do that again?" to which he proclaimed he was tired. He went to do it again but baring in mind we'd been in the park for over an hour and it was now 19:43 my phone screen was dark and only on 3%. Had it not been on power saving mode, it wouldn't have even been able to take a pic. I pointed my phone at Daddy throwing Lottie and all I could see was a black screen. Couldn't even tell if I had them both in the shot if at all. We pulled into the driveway and by this time my phone had been connected to the car charger a couple of minutes and simultaneously my smart phone hooked up with our home Internet and BOOM I realised I had captured the below. My excitement was like nothing I've experienced with my photos before. Baring in mind it was already on my phone, I couldn't get it onto Instagram quick enough. By this point it was 20:15 and I'd only taken the pic at 19:43. I didn't even have chance to fully absorb how stoked I was with the pic before the comments and likes were already streaming in and it was top photo on #FlyingBaby. Obviously by "made sure" I mean I made a conscious effort to pass my phone to Daddy etc... as he wasn't in the pool with us. Apart from pics I request my trainee Instagram husband to take, I can obviously take as many or little as I like but alas that's normally me taking pics of the kids and then I'm not in them. After having the pool out Monday, as pictured above, only to watch it being rained on for the rest of the week, I then emptied the dirty water Saturday morning (the day after the lovely Friday "out" we had above that resulted in the flying baby pic) and couldn't fill it up quick enough so excited was I that we were going to get a couple of days of sun after all before half term finished. Aaron and Lottie were like fish all day Saturday and Sunday and were outdoors way more than they were in. I didn't take many pics as I always worry my phone will get wet or fall in the pool but I was thrilled to capture this moment where Aaron is looking at Lottie adoringly and she is thrilled to have her feet off the bottom floating. Inflatables are a MUST when in water. We got 2 beach balls and the rubber ring she is wearing below and above all for only a pound each from the Online Pound Shop. I had a code to buy them to review. Being at home for 2 days meant I did 7 loads of laundry and what I'm over the moon about is they are all dried, folded AND all put away. I'm now more or less up to date and this morning was easy as Aaron's wardrobe and underwear drawer were both full which was a lovely feeling. Now I've caught up on the laundry I want to try and stay this way. If we'd had days out I'd never have pulled it off. Good weather doesn't always have to mean gallivanting - I didn't feel like getting in a hot car only to spend a fortune on cold drinks anyway. It was wonderful having a holiday in our own back yard. 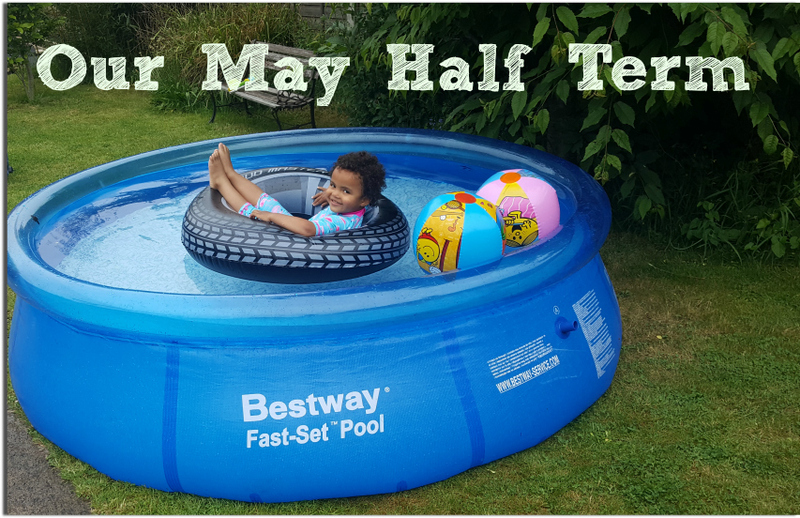 Our paddling pool is years and years old we've had it since our London days but it's been getting lots of compliments - I can't recommend it enough actually. Wednesday 30th May, one of the rainy days, we headed off to JUMP soft play with Rachel in Real Life. As it was wet the world and his wife had the same idea so we queued for a very long time and even though Jump is a place we normally spend the whole day in, they were doing 2 hour sessions to cope with the half term rush. It was fine actually as it was dry by the time we left so we got some time in the park. We'd actually been to Jump the week before too, as Aaron broke up Tuesday 22nd and started half term with 3 inset days, so waking early for school this morning was indeed tough. I don't mind that my "proper" camera started and ended the half term break "dead" - even now I haven't charged it. Carrying around one device was more than enough and you know what, my smart phone might not be great in reduced lighting but I'm always happy with the photos it takes in the great outdoors. Lighting as we know in photography is EVERYTHING!!! All in all it was a beautiful restful half term and just what the doctor ordered. Very wet though either with rain and thunder or in the pool. Maybe we needed some water in our lives LOL. How did you spend your half term? I think we fitted more into this half term than we have in some longer school breaks (Easter for example) but I guess it helped we broke up Tuesday 22nd May with those 3 inset days. Anyway after lots of lay-ins and late nights Aaron is going to be SHATTERED tonight but he has dance rehearsals after school. I guess I will have to be swift with dinner and bedtime so he can have an early night.